He, and the American timber industry, say Canada sells 2x4s and other finished lumber at unfairly low prices here in the U.S. So on Tuesday, the U.S. Department of Commerce will announce whether or not they’ll try to even the playing field by imposing hefty duties, which are like taxes, on softwood lumber coming from across the border. Sanders says the duties could help stabilize Montana’s timber market and lead to fewer sawmill layoffs across the state. “If you’ve got certainty, and you’ve got stability, then the opportunity to provide long term employment becomes more and more of a certainty also," Sanders says. Tuesday marks the department’s decision on a first round of duties. A decision on a second round of duties is expected in June. Together they could add a 30 to 45 percent tax on Canadian lumber. While they might save some jobs in Montana, they could also kill over a thousand jobs just across the border in British Columbia. “I’d say it’s a huge impact,” Harry Nelson, a Forestry professor at the University of British Columbia, says. A hefty duty, Nelson says, could curtail lumber production and lead to sawmill closures and layoffs across the province. “This is the main industry in some of our smaller towns, so it has these kind of knock-on effects, where the sawmill goes down and it takes out a good chunk of the tax base for a local town and a lot of the local purchasing power,” Nelson says. But here in Montana, when a previous softwood lumber agreement between the U.S. and Canada expired in 2015, measures to equalize prices went away, and Pyramid Lumber’s Gordy Sanders says that cost Montana jobs. “What they have already caused in the U.S., with the depressed lumber prices directly related to their actions, there’s been so many mill closures, permanent, in the U.S. I have no idea how many people have already lost their jobs,” he says. The 35-year-old dispute stems from differences between how Canadians and Americans sell timber. Todd Morgan is the director of Forest Industry Research at the Bureau of Business and Economic Research. "There’s a concern by the wood products industry in the U.S. that the lumber that comes from Canada into the U.S. is subsidized unfairly by the Canadian or the provincial governments,” Morgan says. In Canada, most of the timber land is government-owned, so they offer these long-term, very stable leases to timber companies. The idea is that a stable company means a stable community. The provinces want the mills to do well, keep people working and keep tax revenue up. In the United States selling timber is dog-eat-dog, driven by a free market getting logs primarily from private land. That means U.S. sawmills often have to pay more and compete against cheaper Canadian lumber. And they say that’s unfair. “The Canadian provinces are supporting the mills by giving them timber at less than a market competitive price that there’s already this advantage that Canadian mills have over U.S. mills,” Morgan says. The two countries have entered into various trade deals to level this playing field. 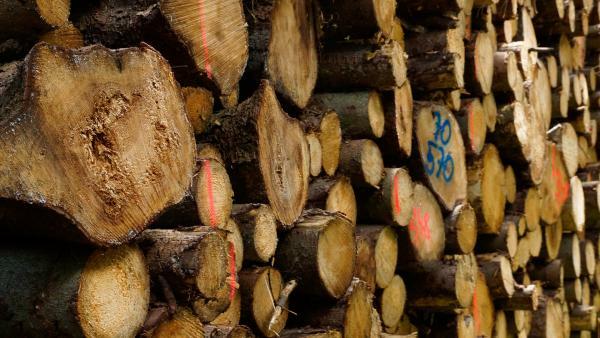 But after a year of failed negotiations, a U.S. timber coalition has now lobbied the Department of Commerce to take the action that could come Tuesday: imposing the first round of duties on Canadian lumber. And, because about a third of the lumber used for building homes in the U.S. comes from Canada, those price increases will be passed along to customers. In fact, lumber prices have already risen by 13 percent since last year in anticipation of these duties. But it might not be all doom and gloom for Canada. They can appeal the decision in international courts, and some of the largest Canadian timber companies have hedged their bets in recent years by purchasing sawmills in the U.S.
“I mean, some of the larger Canadian companies actually have more of their production in the U.S. now than they do in Canada. So in some kind of perverse circumstances, they have both the deeper pockets and they may actually, as a company, benefit as well," Nelson says. The Department of Commerce is expected to make a decision regarding the first round of duties on Tuesday. Last week, President Trump said he intends to take a hard line on protecting American industries, including timber, in Canadian trade deals. A decision regarding the second round of duties is expected in early June. And while there’s been some talk regarding a new trade deal between the two countries, the Trump administration hasn’t yet assigned a chief negotiator to the case. Jobs and job creation were the topics today for Montana’s gubernatorial candidates. The Bullock Administration announced Montana received $1.3 million from the U.S. Labor Department to expand apprenticeship programs. Governor Steve Bullock, D-MT, announced the award during a press conference at the Capitol. “This new funding will be used to dramatically expand apprenticeship opportunities in healthcare, advanced manufacturing, energy, information technology, finance and skilled trades,” he says. One of the issues on Yellowstone County’s June primary ballot is overcrowding at the jail. Voters will be asked to give the county permission to pay for jail expansion. The jail is bursting at the seams. The facility was built to hold 286 inmates, both men and women; as of last weekend there were 504 inmates.